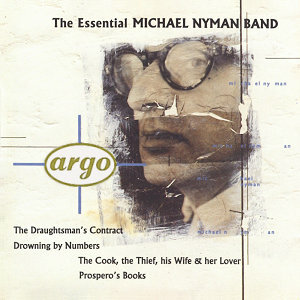 Música compuesta y dirigida por Michael Nyman. Interpretada por The Michael Nyman Band: Alexander Bălănescu (violín), Clare Connors (violín), Ann Morphy (violín), Kate Musker (viola), Tony Hinnigan (violoncelo), Justin Pearson (violoncelo), Martin Elliott (bajo), John Harle (saxofón soprano y alto), David Roach (saxofón soprano y alto), Andy Findon (saxofón barítono, flauta y flautín), Steve Sidwell (trompeta), Marjorie Dunn (corno), Nigel Barr (trombón bajo y euphonium), John Lenehan (piano) y Michael Nyman (piano). Voces: Sarah Leonard (soprano) y Linda Hirst (mezzo-soprano). Grabada por Michael J. Dutton. Película dirigida por Peter Greenaway. Interpretada por Anthony Higgins, Janet Suzman, Anne-Louise Lambert, Hugh Fraser, Neil Cunningham, Dave Hill, David Gant, David Meyer, Tony Meyer, Nicolas Amer, etc. Cortometraje dirigido por Peter Greenaway. Película dirigida por Peter Greenaway. Interpretada por Andréa Ferréol, Brian Deacon, Eric Deacon, Frances Barber, Joss Ackland, Jim Davidson, Agnès Brulet, Guusje van Tilborgh, Gerard Thoolen, Ken Campbell, etc. Película dirigida por Peter Greenaway. Interpretada por Joan Plowright, Juliet Stevenson, Joely Richardson, Bernard Hill, Jason Edwards, Bryan Pringle, Trevor Cooper, David Morrissey, John Rogan, etc. Película dirigida por Peter Greenaway. Interpretada por Richard Bohringer, Michael Gambon, Helen Mirren, Alan Howard, Tim Roth, Ciarán Hinds, Gary Olsen, Ewan Stewart, Roger Ashton-Griffiths, etc. Película dirigida por Peter Greenaway. Interpretada por John Gielgud, Michael Clark, Michel Blanc, Erland Josephson, Isabelle Pasco, Tom Bell, Kenneth Cranham, Mark Rylance, Gerard Thoolen, Pierre Bokma, etc.